Human progress is our cause, liberty of thought our supreme wish, freedom of conscience our mission, and the guarantee of equal rights to all people everywhere our ultimate goal. Ill. 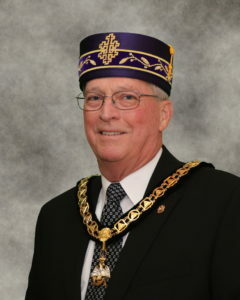 Brother Ted Collins was named Deputy of the Supreme Council in Georgia January 1st, 2017 by Grand Commander Ronald A. Seal. Ill. He was elected Sovereign Grand Inspector General for the Orient of Georgia at the 2017 Biennial Convention. Brother Collins was born May 29th, 1950 in Unadilla, Georgia to Wendell and Christine Collins. He graduated from Unadilla High School in 1968 and received a Bachelor of Science Degree in Political Science from Georgia Southwestern University in 1972. Ill. Brother Collins is married to the former Charlene Greene of Oglethorpe, Georgia who is a retired elementary school teacher. Ill. Brother Collins retired from the Postal Service after 32 years of service in 2006. Ill. Brother Collins and Charlene are parents of one daughter, Wendy Collins Chadwell, and one granddaughter, Weslynn Chadwell. The Scottish Rite Foundation of Georgia, Inc. was established August 26, 1980. Its purpose is to give financial aid to gifted Georgia students and provide funding for Georgia RiteCare speech and language disability clinics for children. The Foundation supports the charitable efforts of Georgia's Scottish Rite Freemasons. The Scottish Rite Foundation asks that you contribute to our charitable causes. Through your generosity, the foundation continues to assist its many charitable causes including a Scholarship program providing tuition assistance to students throughout Georgia and providing assistance to children with Speech and Language Disorders through the Rite Care Clinics. The Scottish Rite in Georgia supports three primary public charities, including Childhood Learning Disability Centers, post-secondary scholarships, and the Scottish Rite Hospital, which is a part of Children's Healthcare of Atlanta. Freemasonry has existed since time immemorial. The Scottish Rite as we know it today developed from so-called High Degrees from France in the sixteenth and seventeenth centuries. The Scottish Rite has a rich and deep history, which has withstood the test of time and continues to perform its good works today. Since its inception in 1801, the Supreme Council of the Ancient & Accepted Scottish Rite has been elevating mankind through its teaching and through its actions. Click here to read more about the Rite and its history. Freemasonry has been said to be a 'beautiful system of morality veiled in allegory and illustrated through symbols'. The Scottish Rite seeks to expand upon the teachings of the Blue or Symbolic lodge by conferring an additional 29 degrees, each of which expresses multiple concepts surrounding charity, patriotism, virtue, chivalry, and more. Within these 'high degrees' can be found centuries worth of wisdom that has been handed down from one generation to the next. Through this, the Scottish Rite is able to help turn good men into better men.